Chic on a Shoestring Decorating: Making a Family Binder... Yes, you need one. Making a Family Binder... Yes, you need one. Hey there, friends! I feel like I've been a little bit MIA lately and I miss you guys!! Summer is just a busy time that's not really that busy. It's busy like take the boys to the pool/library/baseball/swimming lessons/park/slip-n-slide in the backyard, lounge in your jammies all day type busy... not the other not as much fun kind of busy. Since school is fast approaching it's the perfect time to get yourself organized before the bazillion school papers start rolling in. Last year I made big progress organizing bills,school papers and paper clutter, HERE's how I did it. I have been meaning to make a family binder since then but just wasn't sure where to start. Thankfully I found Magic by Marcy on Etsy! 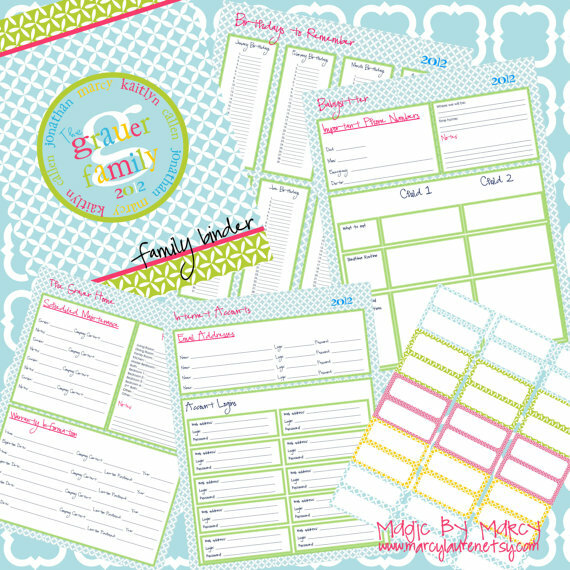 I've teamed up with Marcy from Magic by Marcy to finally organize a family binder. She supplied me with this lovely set of customized printables to get me started. I don't know about you but it's much more fun to organize if it looks cute and these printables are super cute! Like I said, I've been meaning to make a family binder for quite some time and just never could figure out how to set it up. Scribbling down things on notebook paper and sticking it in a folder just wasn't really what I had in mind so then I just stopped doing it. Marcy hooked me up with this set and made it so easy for me to be organized and look good at the same time. All I needed was a printer and a binder. One of my kiddos decided to cut off the plastic cover (because he thought it was the packaging) and make himself a "Drawing Journal". We had a lesson about asking before cutting and I had to go back to Target to get another binder. Next time around I picked up a teal binder to add to the "cuteness" factor. Teal is much cuter, don'tcha think? Blog, Email(s), Facebook, Twitter, Google+, Photobucket, Inlinkz, Linky, Banks, Credit Cards, Paypal, Ebay, Kids school accounts, etc... I could go on and on. I used to keep my passwords in my datebook, but I'd find that I'd never transfer them after the new year started and I'd buy a new datebook so I'd be scrambling to find the old datebook with the old passwords to that one random account I haven't used in 6 months. Now, I try to do my calender online but I really don't want to keep my passwords online for fear that I get hacked or someone steals my laptop. Kind of a bad idea. Now I keep them all in my accounts log-in page. I also have a place for birthdays/anniversaries, paint colors, info for babysitters, emergency info, car maintenance, monthly expenses and a few others. I'm sure as time goes on I will think of other things that need to go in here. One of the best things about the family binder is that now Mr. Chic and I both have easy access to important information. Since I am a stay home mom I am the one usually taking care of these types of records. Now, if Mr. Chic has a question about when was the last time we got the oil changed I don't have to give him a long drawn out explanation of what drawer it is shoved in on what colored paper under the phone book. Please check out Magic by Marcy for these and other cute printables! Disclosure: I was given a free family binder printable set by Marcy in exchange for an honest review of the printables. All opinions are 100% mine!